Paleochora Crete or Palaiochora or Παλαιόχωρα, on the rugged south-west coast of Crete, is 75 km from Chania. Looking over the Libyan sea on a natural peninsula, the view to the east of the White Mountains coming down to the sea is sublime. Παλαιόχωρα is a very Cretan village with a population of around 2,200 people. Although it has terrific beaches, windsurfing and walking and plenty of visitors in the summer, it retains its Greek rhythms. 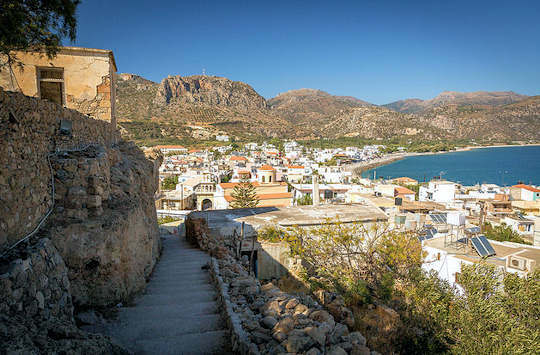 The history of this village shares the colourful history of Crete. The old name was Selino Kastelli from the castle built in 1279 by the Venetians. In 1539 the Pirate Barbarossa conquered the castle and destroyed it. It still survives in ruins, it is interesting to explore and visit the narrow Venetian streets. About Paleochora beaches. Pebble Beach to the east has a long promenade with lamps and benches, leading to Oriental Bay Beach with its line of tamarisk trees. Sandy Beach to the west is the most famous and popular for windsurfing. Windsurfing conditions are excellent on the bay and many visitors come for a windsurfing holiday. At the Old Harbour Quay, ferries leave for Sougia, Loutro, Agia Roumeli, Elafonisi and Chora Sfakion in summer. Boats also leave for the small island of Gavdos, to the south. Diving courses and trips are available for beginners and experienced divers, exploring the untouched waters of the south coast. Also on offer are day tours to nearby beaches and Gavdos island. Sperm whales and Cuvier's Beaked whales are found in these waters. Some years ago the Pelagos Cetacean Research Institute did a research program based in Paleochora to study the local whales and dolphins. The findings of this study can be found on their website www.pelagosinstitute.gr. 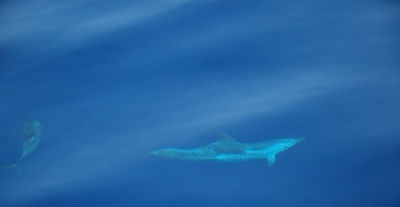 The beautiful Mediterranean Striped Dolphins Stenella coeruleoalba also swim here (above). Dolphin and whale watching trips leave daily from Paleochora in season. 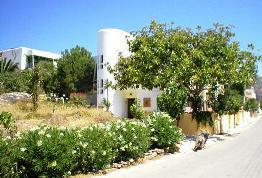 For more about Cretan nature and how you can support conservation programs, see our nature pages. 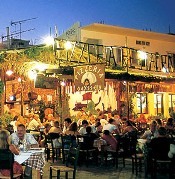 Cafés, bakeries, tavernas and nightclubs are busy in Paleochora Crete during the summer. The sweet shop is called zacharoplasteio and is a central part of any Greek town. Here in Paleochora is no exception, with a wide range of yummy treats. Try one of the Cretan favourites, bougatsa, for breakfast. Seafood is fresh here, try the local specialty, swordfish xiphias, or one of the many fresh fish of the day. There are so many fine tavernas to choose from, along the promenade and in the main street and even a short distance out of town. 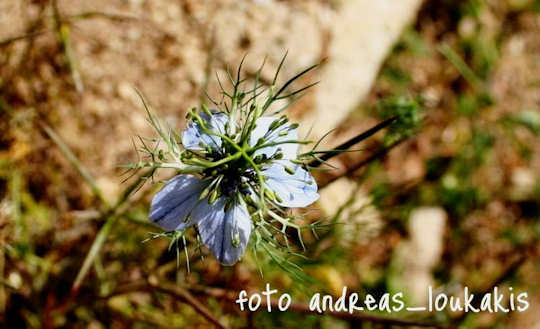 Spring flower tours in April and May are based in Paleochora with daily excursions. Jenny Neal is a local wildflower botanist who leads tours at various times, especially in spring. 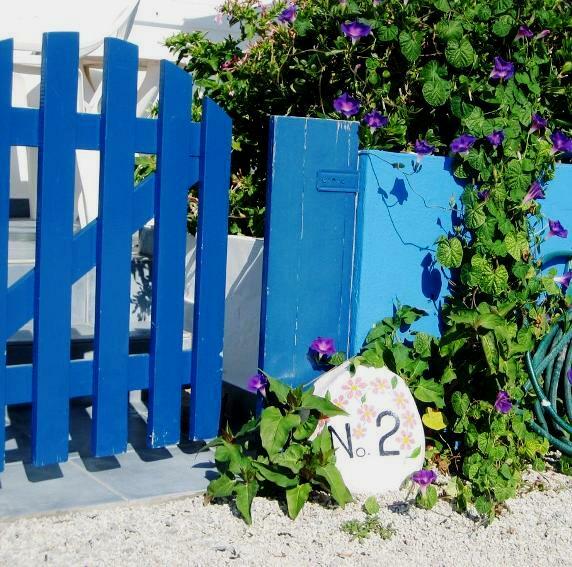 Julia Jones of Flowers of Crete also leads art workshops based on local flora. 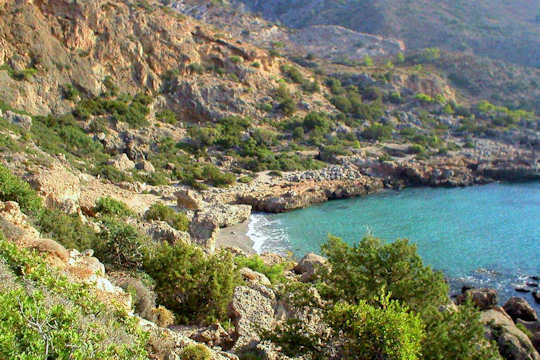 Walks take in the beautiful Gianiskari beaches, Anidri Gorge and walkers can also take the E4 European Walking Path. 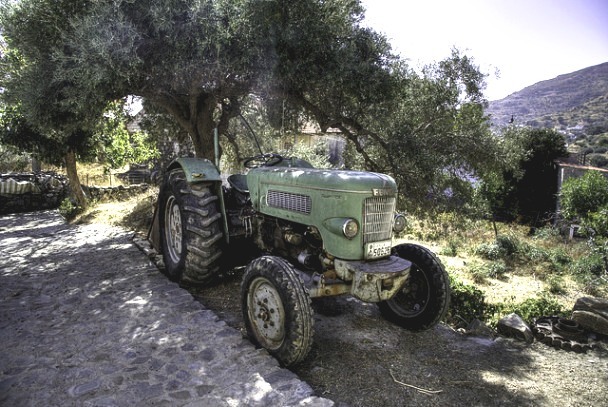 The region is rich in agriculture, surrounded by olive groves, tomatoes in greenhouses, vineyards for wine-making and sultanas, and vegetable gardens. It is a treat to visit the small villages around Selinou province and meet the locals, perhaps to stop for a picnic. Paleochora Crete makes a great base for exploring the west of the island. Hiking and walking are popular, as are tours for nature lovers, climbers and cavers. Beach hopping and historical explorations are wonderful. Paleohora is close to Elafonisi, the Lefka Ori, Agia Irini Gorge, Omalos Plateau and Samaria Gorge. 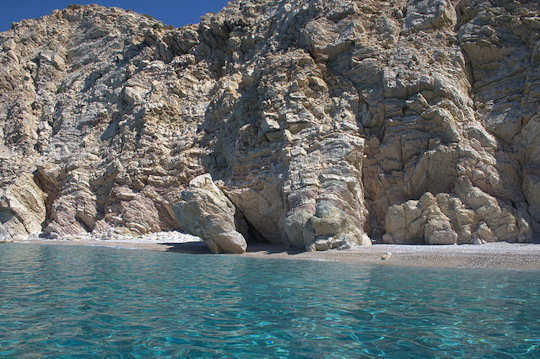 By boat you can visit Agia Roumeli, Loutro and Sougia. Nearby passes the E4 European walking path, excellent hiking in the area with wonderful scenic paths along the south coast. Gavdos Island (above) is the most southerly point of Europe, a small rocky island ringed with beaches and cliffs, with pine and cedar forests, located 65 km from Paleohora town. Its inaccessibility and isolation attracts those really looking to get away from it all; campers, naturists and backpackers. There are three small villages virtually in ruins, with a permanent population of 55, whose main activities are fishing and in summer, looking after the travellers. The small port of Karave is on the east coast, the village of Kastri in the centre of the island is the capital. There are a few domatia and tavernas. If you are planning to stay on the island, book ahead or be prepared to camp. Take a boat with local ferry company Anendyk from Paleochora to Gavdos Island, which takes about 4 hours, on set days of the week only. Check timetables prior to arriving in Paleochora, and make sure you check the return times as accommodation is sparse on the island. The island can also be accessed from Agia Roumeli and Chora Sfakion on the south coast of Crete, at certain times of the year. Take the time to visit the real Crete in Paleochora Crete.